Hi guys! The geometry generation is stable now and I started working on adding actual gameplay to the generation process. Somehow be able to identfy valid spots to place your specific gameplay element. Make sure that you always have enough options to add all or at least a significant subset of the gameplay elements you want to have in your level. In the previous step, I did not only generate the empty room but I already filled it with furniture. So now I decided that I do not want to interfere there by placing logic during that step, but afterwards (mainly to keep the code and the process clean). The slots do also have types so I can not only place items but also replace a complete asset with a gameplay object, like replacing a wall with a vent where I can spawn enemies. Before I started working on generation, I did already implement a locked doors and keys mechanic. Now I successfully integrated it in the generation process. This mechanic will help to motivate the player explore the level instead of rushing through. 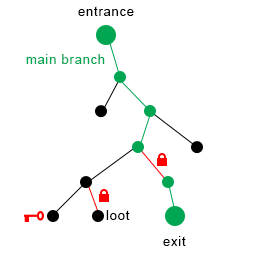 I do not only want to use keys and locked doors lateron but also lock areas in various other ways, like the player will need to flip a switch to restore power in an area, or opening airlocks to extinguish a fire. 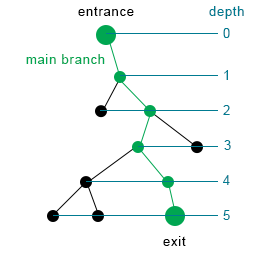 The nodes represent rooms, the edges represent doors. Overall progress – lock the main branch to keep the player from finding the exit/mission objective early. Loot/Treasure – you will want to open this door. These are always leafs in the tree. 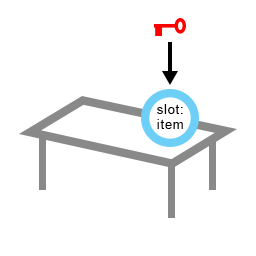 It makes no sense to ask for a key when you already passed a door where you needed that specific key, so such a room is never beyond the main branch lock. The locks mechanism can also be chained along the main branch.